The Office of the Federation President represents the elected head of state and head of government of the United Federation of Planets. To declare candidacy for the Office of the Federation President a candidate with submit an anonymous petition for candidacy for the role to the Federation Council. From there the Council will deliberate upon the application from which a candidate is either approved for candidacy or rejected due to not meeting minimum criteria to fulfill the responsibilities of the position. Candidates will then be entered into the role of candidate and the President is voted into the position through a popular election for a four year term of office. Once elected a candidate can seek the role a total of three times before he/she will not be permitted to continue running for reelection. When a President is unable to discharge the powers of the Office of the Federation President, the Federation Council declares a Councilmember to be President Pro Tempore; the President Pro Tempore then serves for a short term with a special election being called. 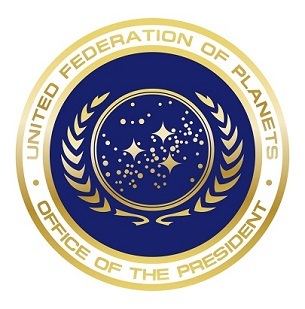 The Office of the Federation President serves as the Executive Branch of the government of the United Federation of Planets and serves as Chief Executive Officer of the Federation. As such the President is the person responsible for the day-to-day operation of the government, coordinating external policy, and dealing with resource distribution issues. As part of the responsibilities of this role, the President was also the commander-in-chief of all Starfleet forces and had authority over Starfleet deployments as well as the ability to declare martial law on Federation member worlds. The president may not declare war; that particular right is reserved to the Federation Council only. The Articles of the Federation requires that the President must execute his/her duties without bias toward a government internal or external to the United Federation of Planets and in accordance with the best intentions for the Federation itself. As the Federation lacks a strict separation of powers found in many governments, the president not only serves as head of the executive branch, but also serves as the head of the legislature. Because of this, similar in nature to a Parliamentary body, the Federation President presides over the deliberations of the Federation Council. Under the provisions of the Federation Constitution the person serving within the role of the President has the ability to set the agenda of Council meetings and can directly bring matters of concern to discussion amongst the members of the Council. In the event of a tie within the Federation Council the Federation President will cast the tiebreaking vote; however, he/she has no ability to vote on matters outside of this scenario. The president has the right to review any legislation passed by the Federation Council and may veto a bill. The President is required to nominate Representatives to the subcouncils with the Federation Council then voting to ratify any nomination following a hearing. The President is expected to seek the advice of the Subcouncils when dealing with issues pertaining to their jurisdiction. At times, when there is a failure to act on this provision, the Committee may exercise their rights equal to that of the President's over an issue. The President may choose to lead any Subcouncil session he or she feels led to do so; however, this is an optional action and a different Chairperson can be appointed. While presiding over a Council or sub-council session, the President reserves the right to determine who may or may not speak to the council from the speaker's floor, and may also determine when voting on a bill or resolution is to take place. Additionally, the President could preside over special tribunals in which the Federation Council served as the judging body and may appoint an Ambassador to exercise foreign policy initiatives. The Presidential Cabinet is the collection of individuals within the Federation government, confirmed by the Federation Council, who serve as the heads of the various executive departments of the Federation and advise the President on matters within their jurisdiction. The Federation Department of Commerce is the executive department of the government of the United Federation of Planets with jurisdiction over trade policy. The current Federation Secretary of Commerce is Available. The Federation Department of Defense is the executive agency of the Federation government charged with defending the UFP and its worlds and outposts from foreign aggression and domestic threats. It is the Department overseeing Starfleet. The current Federation Secretary of Defense is Daeren Iril. The Federation Department of the Exterior is the agency within the Federation government administrating the Federation's foreign policy. The current Federation Secretary of the Exterior is Jonathan Grayson. The Federation Department of Health and Services is the executive agency within the Federation government that oversees the agricultural, educational, health, housing, and the welfare of the citizenry of the United Federation of Planets. The current Federation Secretary of Health and Services is Available. The Federation Department of Science is an executive agency of the government of the United Federation of Planets charged with promoting scientific research and technological development in the Federation. The current Federation Secretary of Science and Technology is Available. The Federation Attorney General is the individual in the Federation government who serves as chief law enforcement officer of the Federation and is the legal advisor to the President of the United Federation of Planets. The Federation Attorney General is appointed by the President without confirmation by the Federation Council. The current Federation Attorney General is Available. The Federation Security Advisor is the individual in the Federation government who serves as chief advisor to the President of the United Federation of Planets on Federation security issues. The Federation Security Advisor is appointed by the President without confirmation by the Federation Council, and is not connected with the Department of the Exterior or the Department of Defense. The current Federation Security Advisor is Available. Named after former President Thelianaresth th'Vorothishria, Château Thelian is the official residence of the President of the United Federation of Planets. Located in the Loire Valley, the Château has been the residence of every president since President Thelian commissioned its construction. The President's private suite is a collection of rooms that are under the auspices of the Federation President and are among the most elegant rooms in the Milky Way Galaxy. Similar to the suite at the Palais de la Concorde, access to the area is through a small reception area manned by the President's Personal Assistant and guarded by members of Federation Security. The oak doors opened to reveal a large, rectangular office comprising the President's desk and a sitting area for guests with a large, transparent aluminum window providing an expansive view of the nearby area. Statues of famous Federation President's - including Presidents Archer, Roth, Ra-ghoratreii, and Bacco - stand nearby while paintings of former Presidents line the anteroom off to the side of the Chamber. Immediately adjacent to the President's Office is the President's Private Library. A large room with a conference table seating 16, the President's Private Library features the records and observations of each President since the Federation's founding. In addition to this were classic works of literature from throughout the worlds of the Federation. On display in this room is also the original copy of the Articles of the Federation. Outside of this area is a large office for Federation Security that connects directly the Main Office and the President's Library. Isolated from the rest of the rooms is the President's Private Bedroom. Featuring a private bath, the President's Private Bedroom is fitted with multiple amenities from throughout the Federation including a custom bed from Bolarus IX that allows the President to sleep a few hours yet feel the equivalent of a full nights rest. Located in the City of Paris, France on Earth, the Palais de la Concorde is the Executive Administrative Building for the United Federation of Planets and features the office of the Federation President. Located on the Place de la Concorde is a cylindrical, fifteen-story building elevated above the Champs Elysées. While the lower levels offer support to the Federation Council, Floors 12 through 15 are devoted to the Office of the Federation President and affiliated staff. Upon entry to the President's Compound on the 15th Floor of the Palais de la Concorde a visitor would enter the formal reception area and be greeted by the President's Secretary. Directly behind the Secretary's Desk was entry to the President's Ceremonial Office, guarded by two members of Federation Security. Visitors to the Ceremonial Office were met by a large, open room set upon two tiers decorated in shades of violet. At the top of a small set of stairs, the President's official desk, equipped with data feeds from his private office and the Federation Council, sits. Directly ahead of the desk are 4 large, oversized chairs that have been made available for the President's guests and twin sofas. 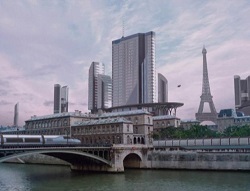 The wall behind the President's Desk featured a large, panoramic window showing the River Seine, the Tour Eiffel, the Bâtiment Vingt-Troisième Siècle, and the Champs Elysées. The Federation Flag hangs at both sides of the window. When sitting at the President's desk the space to the left has a small sitting area that is designed for more personal conversations and for treaties. To the President's Right is a collection of various objects of significance to the history of the Federation. There are three entrances into the Presidential Office; the leftmost of the doors (from the presidential desk's point of view) leads into the turbolift area. The middle door leads to the waiting room, where the Presidential Secretary operates, and the rightmost door leads to the president's private suite of offices and a small anteroom. The President's Private Office, also known as the Ra-ghoratreii Room, is a smaller, more personal work area from which the President can operate. A rectangular room, the Private Office features the President's Private Desk - currently the Resolute Desk - and a dedicated workstation that features enhanced security. A small sitting area is available below a window sharing the same view as the Ceremonial Office. Unlike the Ceremonial Office, the Ra-ghoratreii Room is decorated in red and features a large painting of the former President near the sitting area. An office for the Federation Security Bureau agents assigned to guard the President is adjacent to this room. For situations in which the President cannot leave the Palais de la Concorde a private bedroom has been built in the high security wing for the President's use. Located in the Governmental Complex in the Saucer Module of Starfleet One, the President's Office aboard Starfleet One is a scaled down version of the President's Ceremonial Office at the Palais de la Concorde. Located along the forward bulkhead and providing an impressive view of the space forward of the ship. The President's desk sits below the window. Parallel to the desk is typically a large sofa and several chairs forming two lines. Star Trek and all related marks, logos and characters are solely owned by CBS Studios Inc. This fan production is not endorsed by, sponsored by, nor affiliated with CBS, Paramount Pictures, or any other Star Trek franchise, and is a non-commercial fan-made production intended for recreational use. No commercial exhibition or distribution is permitted. No alleged independent rights will be asserted against CBS or Paramount Pictures.